The Last Chapter is the expansion pack to Soldner-X 2: The Final Prototype which I found to be an enjoyable, if over-priced blast. It packs in three new levels, 11 Trophies and 13 new Challenges. The challenges though, in true Soldner-style,require you to actually earn the right to play them. There’s even a new difficulty mode, Massive Attack, to unlock. When you get around to unlocking Extra Hard that is. 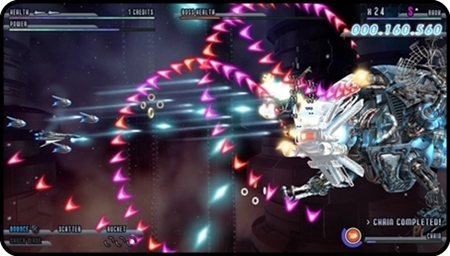 The extra levels can be played through straight away, you don’t have to replay anything for hours on end in a similar way to the way levels were unlocked in the main game. The levels themselves are excellent to play and outpace the original game’s content immediately. Enemy numbers and their attacking fire patterns are perfectly balanced between manic and fair. Sometimes it feels like the best tactic is to hold down the fire button and just concentrate on dodging incoming fire. There’s always a way to escape the rain of incoming fire and you rarely feel like you’re getting screwed over. Making it through a seemingly impossible section unscathed is an absolute rush that other arcade shooters can only dream of providing. You’ll really start to appreciate how crucially responsive the controls are for moving your ship. The levels in the main game were good, but everything seems to be clicking so much better this time around as SideQuest seem to have really found their stride. On the downside the levels aren’t as visually interesting as before as it’s all set in space, or against glowing backgrounds and mechanical areas. The bosses, while producing an admirable challenge aren’t as epic as before, large turrets and giant spinning orbs just aren’t as interesting as giant mechs or an ice cave Cyclops. If the levels themselves weren’t so impressive to play, this would have been a bigger issue, but they are so it isn’t. The scoring system is still a bit baffling, but the more challenges you complete, the more chances you have of unlocking items to help boost your chaining abilities. Playing multiplayer seems to give your score rating a huge boost, so get a cool-headed friend round who has a high resistance to flashing lights and get that S rank. If you’re only interested in playing through some new levels once then this pack probably isn’t for you. If you spent hours levelling up and hunting unlock keys in the original release you’re going to get hours of fun from this for just £3.99. The Short Version: The extra three levels are excellent despite the clichéd boss fights. The way that the extra challenges are locked, means that only hardened fans will keep playing again and again to unlock them. Count yourself as a fan? It’s utter chaos, but you’ll love every second.